This past weekend I payed a visit to Barnes and Nobles - a place which I don't think i've visited in a while. I had forgotten how much I just love to browse. Now I know the library is the same, and more economic and environmental - but there is something about looking through new books that haven't been broken in yet that ... I can't believe I'm using this term ... hypnotizes me. I was in the store for over an hour before I realized it. And still managed to stay another 30 minutes. I also only stayed in the very front of the store. To venture further back could have been dangerous. I managed to scour the bargain bins and found a few treasures! One - a birthday gift for my landlady. Next - a book on how to learn languages! Not a specific language, but several procedures on the best way to learn a language and how to take advantage of the free time we all have in our daily lives. Excellent read for me if I enter the Peace Corps and am subjected to a 3 month intensive language training course. Lastly I found a manual for my digital camera - MY model of my specific not Nikon not Canon digital camera! Completely unexpected but was my favorite find of the night and it was only 6 dollars! I hope this allows me to get the most out of my dSLR. I also bought a novel called Wicked. It's the story of The Wizard of Oz but from the Wicked Witch's point of view. I've heard excellent things about the show so I thought I'd give the book a chance. The only bad part about this idea is that if I ever DO get to see the show, I am surely to be disappointed because every book I read that I see the movie/show that goes with it, the show almost always disappoints because no interpretation of an excellent book ever does an excellent book justice. But I will review the book when I finish. Which brings me to the idea of suggesting some of my favorite books, with possible reviews if I can find the time. Let's start now. I was recently discussing this book with a friend and I love it so much I will being my list of suggestions with it. It's called Maiden Voyage, and it's about a young girl who sails around the world on her own. I've loved this book since the moment I started reading it because I would love to be Tania. She makes the choice to sail alone over the safe option of college paid for in full by her father. She completely fucks up in the beginning because she is trying to navigate with a broken sextant and has to rely on hailing nearby ships for her coordinates. Not her proudest moments. BUT - she eventually learns to navigate with out electronics. Having done this as well - it's no easy feat, especially on a tossing and kicking 26 foot sloop (I did it on a slightly more stable 124 ft ship). She meets many people along the way that help her. I can't decide if I think her weak for constantly needing the help of men around her to accomplish her goal or if I am impressed with how she will ask for help when she knows she needs it. An admirable quality. She seems to have an ease with meeting people on her journey and comes out the other side a stronger person. I will always wish to have an experience like hers, which could explain why I've read the book 3 times already. My dad and I poking our heads through submarine holes. 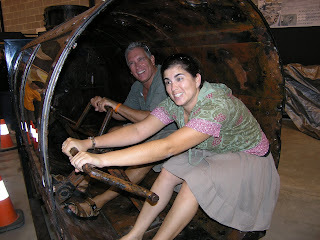 Trying to crank the propeller of the Hunley. So my parents will both be happy to know that today marks the completion of a long awaited experiment. No, I don't know what the big hold up was, but I'm glad to finally have accomplished something in my years at grad school. 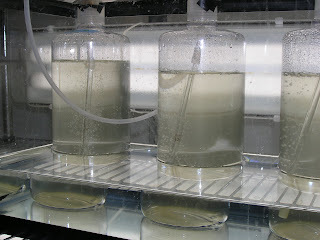 The photos are of my looking all science-y and part of the experimental set-up: Symbiodinium cultures being bubbled with air. 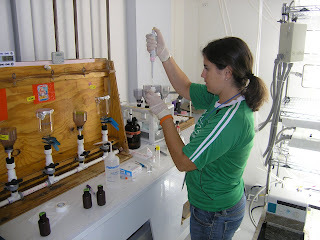 In the next week I plan on spending more long days in the lab to analyze the plethora of samples that I collected. Hopefully a pattern emerges. My dad and stepmom were in town this weekend and I had a wonderful visit! 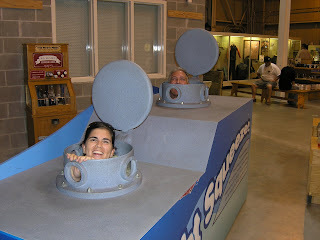 We went to see the HL Hunley which I shockingly enjoyed! I am not a huge history buff as I do terribly with remembering dates. But I really enjoyed the story of the sub.On top of that, we ate many great meals and I have discovered my love of tilefish as well as rediscovered the wonders of creme brulee - the best desert in the world. That will be all for now considering I have a movie date to get to. If you havent seen Saved, I suggest you do. I've started this blog as a precursor to what I hope will be a blog coming to you from the Pacific Islands when I am in Peace Corps service. I am currently trying to finish up my master's thesis in Charleston, SC right now on coral's and DMSP production. I am an avid photographer and bike rider and enjoy trying to use my car less and less not only for the good of my heart, wallet, and environment but also because bike riding is a freeing feeling. Photography allows me to pretend that I am creative and artistic and leave the science part of my brain behind just for a little bit. I like shooting nature mostly, getting really into macro (close-up) stuff, and I like the idea of shooting close-up images of people's skin art (tattoos, duh). I hope the next post comes with some more exciting news - perhaps word of a completed experiment or plumetting over a waterfall in a barrel.